The upcoming version 2.0.1 ROM for HTC HD2 has revealed, that HTC HD2 could finally be heading to the United States on T-Mobile in the first half of 2010. The files and folders dumped from .nbh file has definite references in the form of a folder named “TMOUS”, which points to a T-Mobile US version of the said device. HTC HD2 was released in Europe and Asia in October of this year for a retail price of approx. US $800 for the unlocked version. 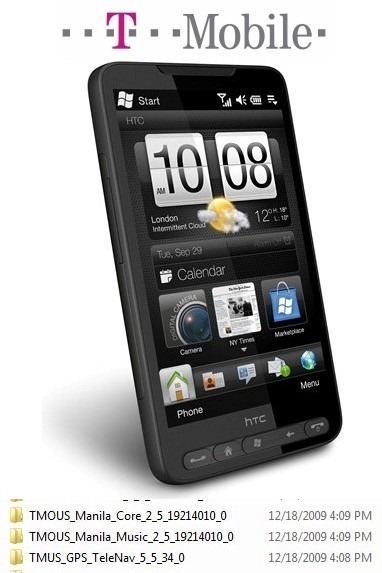 I think the HTC HD2 will have a tougher time in the market, because it uses Windows Mobile as its operating system. The statistics show time and again that there's no love between the phone-buying public and Microsoft's Windows Mobile OS. In January, HTC will release a similar phone, with similar specifications, but running the Android operating system. This phone will be known as the HTC Passion. Two very similar phones, but with different operating system software. It will provide a perfect market test as to whether Windows Mobile is like a lead weight around the neck of a handset's market potential. My prediction is that the Passion will greatly outsell the HD2 in the United States. We'll find out the proof soon. If Passion outsells HD2 it will only be because of the “Droid” marketing push. If you read android reviews, there isn't any more love for it than WM6.5. Plus, with HD2, you are likely able to upgrade it when WM7 finally comes out…. I was afraid this would happen. HTC engineers a spectacular piece of hardware with the latest Windows 6.5 OS (and a promise of WinPhone 7), only to have said technological wonder crippled by the UNspectacular T-Mobile network. If T-Mobile has more than five months exclusivity for this phone in the U.S., they will kill the potential of this phone. Yes, I realize that this is likely (hopefully) just a natural transitioning to the U.S. market, since the HD2 is already in use on European GSM carriers (as is T-Mobile). And yes, AT&T would've been a nightmare, since the HD2 stands to cut into iPhone sales, pitting AT&T against Apple's demands (plus AT&T is customer disservice defined). I sincerely hope that HTC releases a CDMA version, or perhaps better still, a WiMAX version with CDMA Rev. A as a backup. Sprint needs to fight to bring this phone to its CDMA (and 4G) network. Verizon too. C'mon HTC, don't let us down! For all the poeople that wnated this HD2 to a cdma i laugh at you, Im sorry but this phone should only be used on Gsm networks like At&t but since the iphone is already coming to At&t in June-July then they couldnt have it, but we will see how it does onTmobile, which right now has the top customer service and now lower its unlimited plans, Im not surprised when Tmobile surpasses At&t 3Gs network becuase they are doing very well overseas. I know that Sprint is the only one who will be gettin 4g before any other network but during its test it will only have it in major cities and wont be realiable since it wont be available evrywhere, then it will be Verizon and tmobile and at&t will the last.